Don't get me wrong. I can be a people person. I love to entertain and play hostess. But, inviting strangers to come to my driveway and dig through my stuff? I'd like to keep it professional. Buy my stuff and leave, please. Honestly? I'd rather go to your driveway and dig through your stuff. The thing is. I'm not much on dickering. I figure if you have a price on something, you probably want that price. I know. You might expect it, the dickering. And I might play along. Or I might just pay your price and walk away. My folks are hosting a lovely gargantuan garage sale in their driveway at this very moment. I've worked with them the last few days, setting up and selling. And yes, I find myself shopping. Between the dickering folks, the non-English speaking folks, the "can I have it free?" folks, the stealing folks and the folks who wanna talk my ears off, I am whooped! Some of your comments prompt me to add more. There are also the unruly, unsupervised, sticky fingered children. The early birds. The folks who jump the fence and peruse the goods after closing. And the tag switchers! Bad people. And those people who throw dirty diapers out the car window before driving off without one child in a carseat or seatbelt. My dad is convinced that if we speak crossways to the people, they will immediately go knock down or steal the garage sale signs. It's been done by someone more than once! 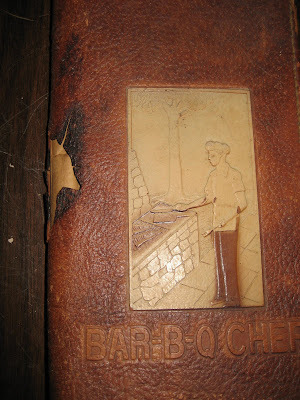 This Bar-B-Q Chef knife holder? Love it. If nobody buys it, I'm stealing it from Dad. No dickering. Outright raising my shirt and sliding it into my waistband. Just like the thief who stole a cell phone I was trying to sell. Ugh. I must admit. 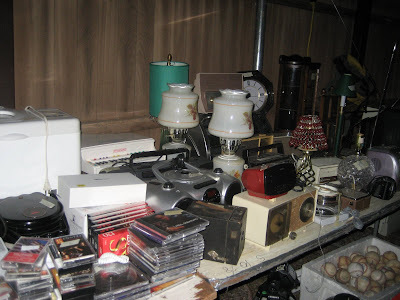 We do make incredibly good money in the 3 garage sales the city allows a year. We have regular customers that love to see our signs. We have nice people who help with translations. Some people just pay what is on the sticker, because, ya know...we know it's a garage sale. We priced it pretty cheap in the first place. The last thing we want to do is pack it up to take away or store. We want it gone! Yes, these are the very same parents who are coming to sell at the sale in Poetry on May 16. I assure you. They will have lots of good stuff. Like my favorite thrift store, my folks restock almost daily! And, by the way, they can dicker with the best of them, too. Tell me. 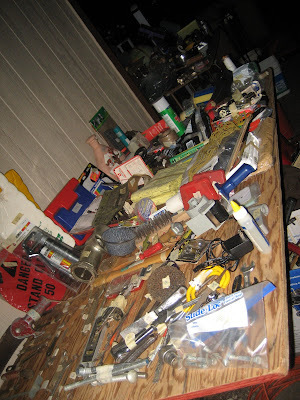 Have you any horror stories from hosting a garage sale? That sale is mammoth! I've taken a break from having sales after one I held two years ago. The things that occurred made me temporarily lose faith in mankind. Ugh! I wish your parents many sales though! 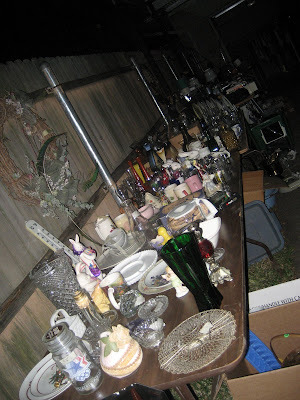 No garage sale horror stories except for my Mom who keeps selling my good stuff I left at her house! She sells the goodies for change! She keeps telling me to "get it or she is gonna sell it". Hard headed woman! Glad I didn't inherit that trait! :) I can't wait to meet your parents on the 16th! 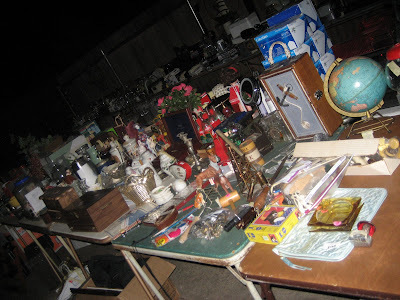 Oh Lord, I had two women (a mother and daughter) changing the prices tags on stuff last time I had a garage sale...garage door was up to child head height so the kids could come in and out and someone is trying to buy stuff out of the garage. NO! If it was for sale, it would be out here and NOT in the garage. I'll honestly never have one again. I try to clear out every few months so I don't have to garage sale...I honestly doubt I'd make much so I would rather donate it...Good luck! OMG they have lots of stuff. I had some tag switchers once, and fortunately I KNEW what I had priced it at and it wasm't $3. There is a certain group of folks that do not watch their children, I'm amazed any of them actually reach adulthood without getting run over in the street. yep it can be difficult. But green is green (money) and it's the same all around. Hope you have a great sale. See you on the 16th. See you stopped by our blog today. Just wanted to say Hi, any friend of the girls at Junk Fest are good with us! Not really. Usually all goes well. Yes, people try to negotiate but I let them know straight up. Usually we end up giving stuff away by the end of the day, and then everybody loves us. This is why I do not do garage sales, ever! I don't have them at the house and I don't go to them. In the "good old days" I could go and bring home a truckload, but I'm afraid those days have gone with the dodo bird! I can only look at so many baby clothes and exercise equipment. Plus, and this is a biggie, when we do go out Danny always gets prices like a quarter of 50 cents...me, they ask prices like 10.00 dollars! I kid you not. So, he just leaves me at home. I don't do them here at the house for the same reasons as you and I just can't bring myself to sell stuff for a dime. I'd rather just donate it to some of the local groups. I told you...I'm lazy! Just got around to reading your blog. Dickerin is all apart of garage sales. I never offer what it's marked at. Where's the fun in that? I guess I've been working at the wrecking yard too long! LOL. And non-english speaking people are used to dickering, cause that's how they do it in there country. Remember - no matter what you paid for it (or marked it at), it's only worth what the next person is willing to pay!